Tell us about your beginnings in librarianship and archival science, what sparked your interest in the field? Prior to my graduate degree in Information Studies I worked as a cultural arts programmer in San Antonio, Texas with a 30 years old non-profit called the Esperanza Peace and Justice Center. While there, I came across a small sized room full of what I now call records. Back now I would have probably called it stuff or things. These things consisted of everything from newspaper clippings, grant submissions and paperwork, legal proceedings, VHS tapes, life size puppets to protest banners, flyers, leaflets, newspapers, and magazines. These records documented almost every aspect of the organization’s history as well those communities the organization worked with and for. For some reason I became obsessed with creating order out of what many staff considered disorder, but as I sought out guidance on how to organize these sorts of things I quickly realized that I lacked the proper training to do it. 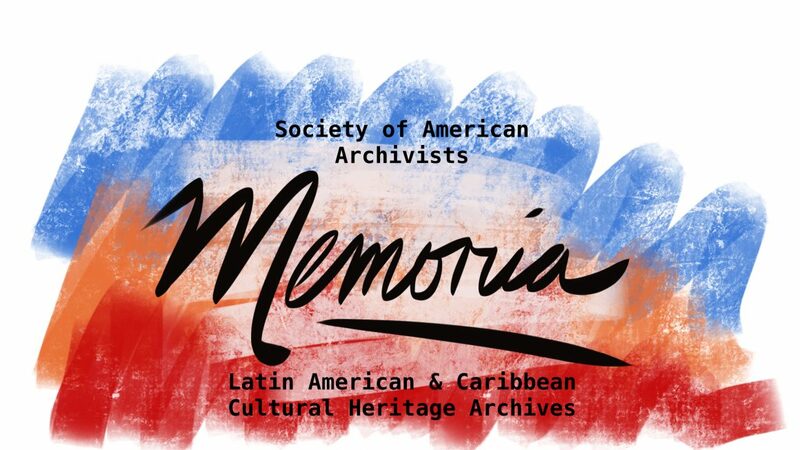 As a result, I decided to pursue a degree in archival studies and my hope had initially been to learn more about community archives and how it related to efforts such as the ones I was involved with while at the Esperanza. Long story short, I applied to the University of Texas at Austin School of Information in hopes of remaining in close proximity to the Esperanza to continue the community archives work I had started before I left. Your current position as metadata librarian at LILAS Benson Collections, what does it entail? Working as a metadata librarian on exclusively post-custodial projects means I am responsible for many unusual tasks as well as those typical of an information professional working with digital collections. I personally consider myself a trained archivist and my current work duties more closely reflect the responsibilities of a digital archivist with an emphasis on metadata collecting, managing, and development of practices. As we work to build post-custodialism at the Nettie Lee Benson Latin American Special Collection, I work on several tasks from normalizing and managing existing metadata from previous Latin American partners to creating methods for the collection of new metadata from our more recent Latin American partners. This can include learning more about the diverse metadata needs of our partners to thinking through how the creation of metadata would benefit the multiple stakeholders of the project. In addition to strengthening our post custodial work, I also consult on the technical and metadata specific aspects of our soon to be now digital repository system with a particular focus on incorporating linked data principles. On other occasions, I work on revaluating or consulting with the librarians and archivists at the Benson regarding their metadata practices or special projects in hopes of empowering the full LLILAS Benson team to adequately create, manage, and reuse our collections’ metadata. Can you share with us any other project or initiative dealing with Latin American or Latino communities? At the Benson we always have exciting projects with some in very early stages to others in a more mature phase. I previously mentioned my work with post-custodialism, so I love to share information on the project, Latin American Digital Initiatives (https://ladi.lib.utexas.edu/) This project started around 2013-2014 with featured collections coming from partners in El Salvador, Guatemala, and Nicaragua. My current position contributes to the growth of this project with new partners coming in from Mexico, Colombia, and Brazil. The Benson is also conducting groundbreaking work in transcription using the software known as From the Page (https://fromthepage.com/) as well as hosting multiple post-doctoral scholars with one currently focused on reevaluating the older digital collection, the Archivo Historico de la Policia Nacional de Guatemala (Read CLIR scholar Hannah Alpert-Abrams article on her current position: https://www.clir.org/2018/01/partnering-digital-archives-human-rights-guatemala/) . How do you envision the field of Latin American librarianship (in terms of archival collection development and outreach)? As a first generation daughter of Honduran parents, I oftentimes wonder how the US latinx communities and Latin American communities will continue to converge. As an archivist and metadata librarian, I oftentimes see these convergences or possible points of intersection when I look at the materials and the things they document. For the Central American communities I exists in or work with, the changes in migratory practices whether forced or long existing really have an impact on who these records document and where they end up. I suspect and frankly hope that this intersection will strengthen the bonds between our geographical regions and that libraries in particular those with a digital footprints will create connections across borders, lands, and time. Finally, what has been the most rewarding part of your career as a multicultural librarian? Working in multicultural context whether directly through the materials I engage with or through the collections my colleagues develop and manage has really given me multiple opportunities to learn, unlearn, and appreciate the breath of Latin America and what some call Latinidad. I was not born in Honduras and that has oftentimes created a cultural barrier between my parents, my family that still lives in Honduras, as well as between other recently arrived Hondurans and me. I grew up with a different language, cultural practices, values, food, expectations, etc. that even though I frequently traveled back and forth between Honduras and the States I am still very much a gringa in some respects. One of the most rewarding aspects of working at a Latin American Special Collection is the ability to continue learning about not only the history of the country I know I should have a connection with, but also about the people, the current realities, and the ways in which both of my worlds continue to collide. One of the biggest fears includes the fact that I could be the generation that disrupts or distances itself from my parents and grandparents cultural history and practices. I hope that by being constantly surrounded by Latin American materials, people, and information there is less of a chance that I forget, overlook, or ignore the things I do not see on a day to day.